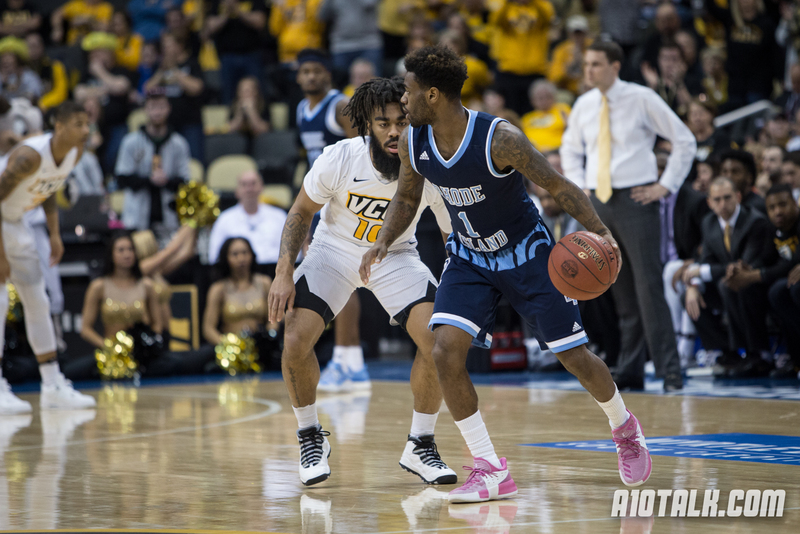 The Rhode Island men’s basketball team is the clear favorite in the A-10 headed into the 2017-18 men’s college basketball season. Fresh off of an Atlantic 10 tournament title and a Round of 32 appearance in the 2017 NCAA tournament, the Rams will be looking for more. Going forward, without the services of frontcourt anchors Hassan Martin and Kuran Iverson, Dan Hurley will orchestrate a more guard-oriented team. Throughout the approaching season, there will be at least three big questions that loom for the Rhode Island men’s basketball program. 1. Can Rhode Island succeed under the pressure of being the undisputed preseason favorites in the Atlantic 10? For the past couple of seasons, Rhode Island’s men’s basketball team has been looked at as a preseason favorite, next to the likes of Dayton and VCU. Coming into the approaching campaign, the Rams from Kingston, RI stand alone at the top of everyone’s Atlantic 10 preseason polls. The hefty expectations for Dan Hurley’s team are nice, but they come with a territory. Making it into the NCAA tournament for the second straight season is the number one requirement. Winning the Atlantic 10 regular season title and repeating as Atlantic 10 tournament champions are the expectations for this basketball team. Lasting much longer in the NCAA tournament in March is the long-term goal. With all of the preseason hype and expectations surrounding the Rhode Island Rams, now is not the time to grow complacent. 2. Can the Rams frontcourt play well enough to not be a detriment to the team? Everyone knows about the guards upon guards that will lead this Rhode Island team to numerous victories. While the Rams’ backcourt is arguably the best in the conference and one of the best in the nation, questions surround the Rams’ frontcourt. Beyond Cyril Langevine, the frontcourt players for URI lack experience in big-time situations. Even the aforementioned averaged less than 15 minutes per game last season. As of now, there is no telling who will slot in to start alongside the New Jersey native. Andre Berry has not played significant minutes since his sophomore season. Ryan Preston will need to get acclimated to Division 1 college basketball. Nicola Akele needs to prove that he can consistently defend the paint. Michael Tertsea and Michael Layssard Jr. need to play their way into a considerable workload. Bottom line: the frontcourt has to prove itself, especially if the Rams are seeking the Sweet 16 and beyond. 3. Can E.C. Matthews play like the star that his team needs him to be? Despite the aura and hype around E.C. Matthews, there is still a missing element. On a day-in and day-out basis, #0 of the Rhode Island Rams has not always been able to show up in the games that mattered the most. When URI needed to rally back in a close game at Valparaiso last season, Matthews was nowhere to be found. In pivotal contests against Duke and Providence, Matthews was held to single digits and did not step up to the plate. Whether the barrier is mental or physical, the Detroit, Michigan native will be expected to be a true leader in his senior season. In the 2017-2018 season, Dan Hurley needs the E.C. Matthews from the 2017 Atlantic 10 tournament to show up every game. For a player that still has a realistic opportunity to be a NBA draft pick in 2018, there is no time like the present.